Despite his preface upbraiding physicists for their work of the past 50-75 years, the main text makes reasonable claims based upon well-founded experimental and theoretical results. The book endorses earlier work of Einstein, Feynmann, Reimann, Lorentz, Maxwell, Planck, and others while making computational and conceptual adjustments to accommodate modern experimental results. Also in the text, Bohr and other die-hard quantum statisticians are continually under attack for their poo-pooing of possible phenomena, algorithms, and concepts behind the observed quantum behavior. Bohr and his clan, apparently, claimed that the statistics made up the whole baseball team of quantum physics--and that we should not, and could not, look further. Classical Mechanics explains un-coherent, uncharged systems such as cannon balls, planets, vehicles, etc. Classical Electrodynamics explains un-coherent, charged systems such as conductors, currents, and their fields. Thermodynamics explains how macroscopic statistics, such as temperature and entropy, guide the time evolution of systems. Modern Quantum Mechanics tries to explain coherent, charged systems. Here 'coherent' refers to quantum coherency, where many particles/atoms march to the same drum such as the photons in a laser, or the electrons in a superconductor, or any isolated one or two particles. Another description of coherency is that the states are quantum entangled; their time-evolution depends upon each other. The thrust of Carver's book: QM applies to all matter--not just small systems or isolated particles--is well made. He brings up experimental data from superconductors to illustrate that the phenomenon of coherent quantum entanglement can, and does, occur at macroscopic scales; and that such behavior is very quantum. Thus he proves, quite convincingly, that quantum mechanics applies to all coherent systems. He then closes by making some very important points. He shows that quantum behavior of such systems can be expressed in quantum language (wave function), relativistic language (four-vectors), or electrodynamics (vector potential, scalar potential) in an equivalent fashion. This is important, as it proves that a superconductor is macroscopic, exhibits quantum behavior, and that these quantitative results agree with those found from the other approaches. He makes the point that the quantum and relativistic equations show that electromagnetic phenomena consist of two parts: one traveling forward in time; the other backward in time. Feynmann and others have said this for a long time, and he shows how thermodynamics (or un-coherent behavior) forces what we see as only time-evolution in one direction in un-coherent systems. He illustrates, modeling single atoms as tiny superconducting resonators, that two atoms that are coherently linked will start exchanging energy. This causes an exponential, positive-feedback loop that ends with each atom in a quantum eigenstate. Thus quantum collapse is neither discontinuous, nor instantaneous; and in fact makes a lot of sense. He explains, using four-vectors, that all points on a light-cone are near each other in four space. This point--together with (2)--shows that there's no causality contradiction between relativity and quantum mechanics. For example, he explains that two entangled particles, such as photons light years apart, can affect each other immediately if one falls into an eigenstate, since the four-dimensional distance between them (R1 dot R2) is zero. Although separated in three space, they're neighbors in four space. Through these demonstrations and proofs, he successfully suggests that there is a way to further develop the 'behavior of charged, coherent systems' such that quantum mechanics and relativity will agree--but the conceptual changes he suggests are necessary and must be further developed. Also, he admits that a better, more appropriate mathematical and computational methods will be needed, since the complexity of coherent systems runs as n^2. Pleasantly, then, the book makes elegant, defensible, mathematical and conceptual steps to resolve some nagging points of understanding. Also, the narrative gives the best introduction to electrodynamics and quantum mechanics that I've ever seen. Since the theoretical criticisms and experimental data are quite valid, his proposed resolutions are eye-opening and valuable. The methods he suggests greatly simply thinking about complicated quantum/classical problems. New approaches for future theoretical research are also suggested. Despite the dark tone in the preface, the book is positive, enlightening, and well anchored to accepted, modern experimental results and theoretical work. It's a short book, about 125 pages, and well worth the read. Familiarity with classical and quantum physics, and special relativity, is required to get the most out of it. As you can tell, I enjoyed it tremendously. As you can see the sensor's ability to capture detailed resolution, both in the grayscale and colour resolution goes way beyond what we could expect from even the best Bayer pattern sensors. Images from the new Foveon X3 sensor are more reminicent of super high quality slide scans, but go even beyond that with no trace of grain. Very impressive. This could be the first sensor to truly surpass film. Last November I excerpted from a year old interview with Carver Mead by the American Spectator. He had some pretty interesting things to say about the sorry state of obscurantism that typifies the standard interpretation of quantum mechanics. This is something which he blames largely on Neils Bohr and the Copenhagen school. Einstein was never happy with this formulation, he considered a mere statistical description of nature to be the defining charcteristic of a theory that was incomplete and in need of more work. Mead agrees and goes on to claim that a lot of the confusion and counter-intuitiveness of QM would go away if we stopped imagining elementary particles like electrons and protons as tiny points but instead see them as waves with a boundary. Of course it helps to have a stellar career in solid-state physics under your belt before you start kicking around the likes of Neils Bohr. Any way, what I wasn't aware of until quite recently was that Carver Mead and his company Foveon have been very much in the news over the past year. Foveon has introduced into the highly competitive digital camera market a new colour imaging technology that seems set to revolutionise consumer and professional digital photography. If you are in the market for a digital camera like I am, it might be prudent to hold on to your cash just a little longer, this technology is hot and makes nearly every digital camera on the market right now look pretty near to obsolete. At the risk of this sounding a bit like a sales brochure (unpaid mind you), I thought that the details of Foveon's X3 Technology were interesting enough to report here. The way digital cameras work at the moment is pretty brain-dead. 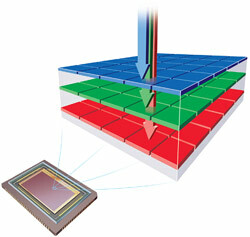 Conventional capture technology works by using a single layer of photo detectors arranged in a mosaic pattern to capture the red, green, and blue components of light. Each photo detector filters for a single colour and it is only though the combination of signals from adjacent detectors that it is possible to calculate the correct colour of each pixel. One downside of this scheme is that colour filters are very inefficient. 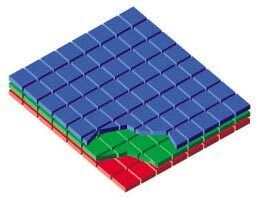 A blue filter throws away all red and green information, a green filter throws away all red and blue information and a red filter throws away all green and blue information. In effect, an arrangement like this only uses about one third of the available light. Also, in order to reconstruct the correct colour of a pixel, the camera needs to perform a large series of interpolations - about 100 calculations per pixel. If you double the resolution of the camera, you need to quadruple number of interpolations. This places a rather large computational burden on the camera which translates into increased battery drain. Another problem with interpolation is that, at best, it is only an approximation. At worst, it's a major source of artifacts like colour jaggies, rainbows and moiré patterns. This is especially noticeable with fine textures and text. X3 does far better than this approach, capturing all three colours per pixel by layering the three colour detectors on top of each other in a manner similar to conventional 35mm colour film. By doing this it becomes possible to take advantage of the natural colour-separating properties of the silicon itself i.e. that light of different wavelengths is absorbed at different depths in the silicon: blue light near the surface (0.2-0.5 microns), green light farther down (0.5-1.5 microns) and red light even deeper (1.5-3.0 microns). X3 arranges photo detectors at each depth to read the colour components for each pixel directly and without any need for colour interpolation. In effect you get a camera with increased light sensitivity, more accurate colour measurement, sharper images and far less distortion. Foveon X3 technology visibly improves image quality, as any comparison of equivalent pixel counts will demonstrate. In this case, a 2-megapixel file taken with a mosaic sensor is compared to a 2-megapixel file taken with Foveon X3 technology (more fully described as "2 MP x 3 layers" to reflect that each pixel measures three colors instead of one). As you can see, the camera equipped with Foveon X3 technology takes sharper pictures. That's because it captures twice as much green as mosaic image sensors, and the green wavelengths of light are critical in defining image detail. These pictures demonstrate how Foveon X3 technology improves color detail. 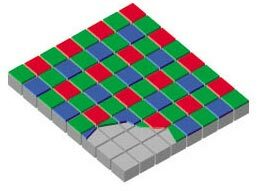 The difference is that Foveon X3 image sensors measure full color at each and every pixel location, while mosaic sensors capture 50% of the green and just 25% of the red and blue. As shown here, Foveon X3 technology offers resistance to unpredictable artifacts. A mosaic image sensor is more vulnerable to artifacts, largely because it must rely on complex processing to interpolate the colors it missed. No amount of processing power can completely take the guesswork out of color interpolation. The Sigma SD 9 is currently the only camera sporting the X3 sensor. At around USD $2000 it's out of the range of most us happy snappers although Foveon claims that cheaper cameras around the USD $400 mark will be on the market fairly soon. And just who is this Rochelle Altman anyway? Speaking of Shanks, Altman and the Ossuary, I rather enjoyed this little snippet from a recent conference. Shanks then addressed questions of authenticity by first observing that the ossuary itself is first century, as everyone agrees, [Note: Several scholars disagree. ]; it is the inscription that is under debate. With regard to the question of whether the second half is original, let the paleographers decide. But after this reasonable beginning, Shanks went on the attack. I don’t understand the suggestion that part of the inscription is two or three hundred years later, he said. And just who is this Rochelle Altman anyway? Has anyone ever heard of her? Shanks was obviously not interested in engaging in scholarly analysis but rather wanted to win the point by innuendo and personal attack. After admitting he could not follow her analysis, he decided to imply that she had no right to participate in the scholarly discussion. After discussing the logical reasons why he thought the box and its inscription was not a modern forgery, Shanks then went on to say that there were two kinds of antiquities collectors: good ones and bad ones. The good ones were willing to share their possessions and let the scholarly world publish them, while the bad ones hoarded them in private and showed them to no one. The goal, Shanks claimed, was to turn bad collectors into good ones. He further when on to argue that there was a precedent in dealing with black market items out of archaeological context, the Dead Sea Scrolls, which were found by Bedouins and sold to Israeli authorities and others. To climax his remarks, Shanks paused dramatically and said in a calm yet forceful voice, “All questions are legitimate. What is not legitimate is to vilify and castigate those who attempt to learn.” This was an interesting way to conclude, I thought, given what he had just said about Dr. Altman. The 15-line inscription on the tablet, written in ancient Hebrew, details repair plans for the Jewish Temple of King Solomon. Once again we have on our hands a sensational new archaeological find that seems to have a strong connection with the Bible. Israeli geologists ... they have examined a stone tablet detailing repair plans for the Jewish Temple of King Solomon that, if authenticated, would be a rare piece of physical evidence confirming biblical narrative. The find — whose origin is murky — is about the size of a legal pad, with a 15-line inscription in ancient Hebrew that strongly resembles descriptions in the Bible’s Book of Kings. saying it was uncovered in recent years, during renovations carried out by the Muslim administrators of the mosque compound known to Muslims as the Haram as-Sharif, or Noble Sanctuary, and to Jews as the Temple Mount. Apart from noting that the discovery was made in Jerusalem, the researchers do not disclose where the inscription was found. But sources have indicated that the writing surfaced in the Temple Mount area as a result of widescale excavation work done in recent years in the area by Muslims, and that Palestinians relayed the fragment to a major collector of antiquities in Jerusalem. Also like the Ossuary, the owner is reluctant to identify himself and accusations abound that the tablet was obtained illegally under Israel's antiquities laws. "I am speculative about the authenticity of an item that is not found in an organized archaeological dig," Dr. Eilat Mazar, an archaeologist at Hebrew University specializing in Temple Mount excavations said. "In a case like this, authenticity is doubtful." Finally, once again we have Hershel Shanks of Biblical Archaeology Review, acting as cheerleader. Dr Shimon Ilani, of the Geological Survey of Israel, said that carbon-dating had established that the stone’s crust was 2,300 years old. Yet Professor Joseph Naveh, an academic asked to analyse the fragment in 2001, has declared it to be fake. He confirms that most of letter shapes are of 9th-century BC Hebrew, but says that others are typical of 7th-century Aramaic and Phoenician. Adnan Husseini, the director of the Islamic Trust that administers the Temple Mount mosque compound, denied that the tablet was found on the Temple Mount. "At the best this is a joke. I'm sure the item was not taken from the Temple Mount grounds, and it does not provide any proof of the existence of a Jewish Temple," Husseini said. The discovery of the tablet has aroused a storm, and some scholars believe that it is a forgery. If it turns out that the stone is authentic, the discovery should help in examining the truth of the events described in the book of Kings. Neeman's article in the Dutch periodical refers to two texts from the book of Kings with a unique vocabulary: the story of the repairs carried out by Jehoash king of Judea in the Temple (Kings, 12), and the story of the altar built by Ahaz king of Judea, which was similar to the altar in Damascus, in an attempt to placate Tiglath Pileser, king of Assyria, who conquered Damascus at the time (Kings II, 16). Neeman assumed that for those two events one can theorize that the writer who recorded them had access to earlier written sources. The theory he proposed was that the writer had relied on two royal inscriptions: one written by King Jehoash and one written by King Ahaz. "The `Jehoash inscription,' whose authenticity was verified this week by the GSI, is too similar to the theory I explained in my study," says Neeman, and concludes from this "one of two things - either I hit the nail on the head, and my theory was confirmed fantastically, or the forger read my theory and decided to confirm it. Additional harsh reservations about the GSI decision regarding the authenticity of the inscription came this week from Prof. Ed Greenstein, an expert on the language of the Bible and ancient Semitic languages, also of Tel Aviv University. Greenstein points out that the way in which the expression "bedek bayit" was used in the inscription shows that the forger apparently did not understand what it meant in biblical Hebrew. "In the language of the Bible, `bedek' is the cracks in the building," explains Greenstein. "You reinforce the `bedek habayit' [the cracks in the building]. If you do `bedek bayit' you are making a crack in the building and ruining it. `Bedek habayit,' in the language of the Bible, is the problem that must be repaired. Someone who understands biblical Hebrew would not have used the later expression [in modern Hebrew, it means making repairs] that was derived from this expression." Ancient Greek Wreck Found in Black Sea Many interesting things await discovery at the bottom of the Black Sea.